The New Masses arose in 1926 when some contributors to The Liberator were unhappy that it had been taken over by the American Communist Party. Over the next 22 years, The New Masses, published radical, anti-capitalist cartoons (here's an example of a New Masses cartoon satirizing the National Association of Manufacturers), fiction, poetry and news articles by leading thinkers and activists like Max Eastman, Upton Sinclair, Ernest Hemingway, Carl Sandburg, John Dos Passos, Ezra Pound, Waldo Frank and Eugene ONeill. I had no illusions about the number of readers I reached through New Masses, but it was the only publication I knew of that was willing to finance digging into Nazism, fascism and anti-Semitism here and to publish what I found; I cared little if the magazines primary interest was to show that big business in the United States, which was ready to finance a fascist coup as big business had done in Italy and Germany, was thus an enemy of democracy and the people (A Man in His Time, p. 321). 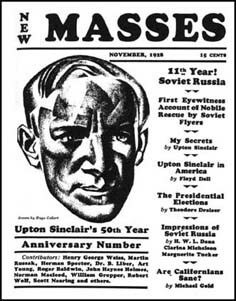 The name, The New Masses, was used because some of its founders, before involvement in The Liberator, had created an artist, socialist magazine called The Masses. It was a socialist co-operative founded in New York in 1911. Its editor, Max Eastman, and most of the contributors, like John Reed who reported on the revolution from Russia, denounced WWI as a competition between imperialist powers. A few however, like Upton Sinclair, supported American entry into the war and withdrew from the Socialist Party and The Masses. The Masses was banned from the U.S. mails when the U.S. entered the war. In 1917, the government began launching lawsuits against the magazine under the Espionage Act. Although all three lawsuits against the journal failed, it was forced to cease publication in 1918. That was the year that their collective began to publish The Liberator. John Spivak, A Man in His Time, 1967.